TheGunBlog.ca — Browning said its Hi Power pistol is “no longer in production,” signaling the end of a gun once made in Canada and that is still the general sidearm of the army. The Hi Power in 9 mm was one of the most innovative and popular handguns of the 20th century. Some models were made by John Inglis & Co. in Toronto during World War II, and have been used by the Canadian army since then. No longer in production. The Hi-Power is one of John Moses Browning’s finest designs. 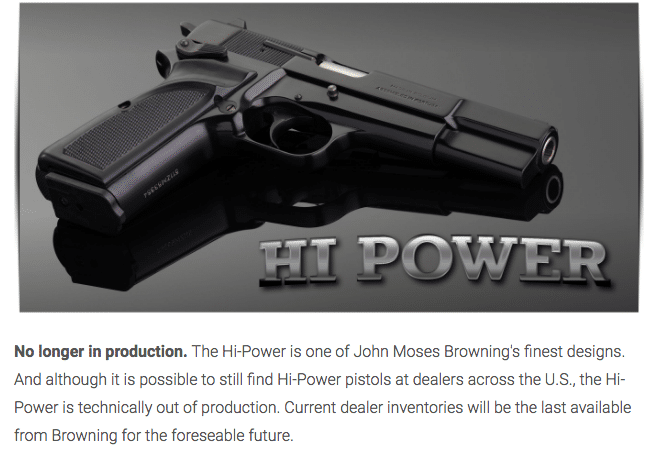 And although it is possible to still find Hi-Power pistols at dealers across the U.S., the Hi-Power is technically out of production. Current dealer inventories will be the last available from Browning for the foreseable future. Browning is a brand of FN Herstal of Belgium. The Hi Power isn’t listed at all at Browning.eu. The end of the Hi Power was reported yesterday by Shooting Illustrated magazine.